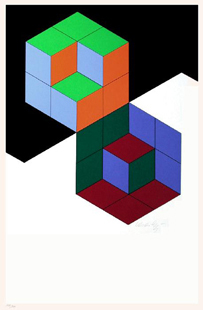 Victor Vasarely, lithographs, screenprints, original prints. Here are the prints handsigned (lithographs and screenprints) by Victor Vasarelly that are presently for sale. Click on the image to enlarge it and see the description of the print. 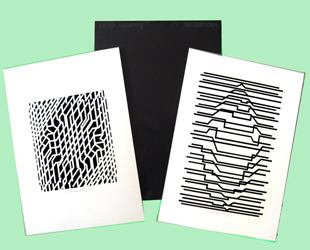 Unless otherwise specified all the prints shown on this page are signed by Vasarely and are original. 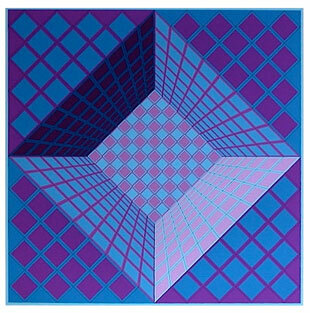 Victor Vasarely was born in 1908 in the city of Pecs in Hungary. He first studies medicine and entered the academy Mühely in Budapest to learn graphics art and advertising. In 1931, Vasarely went to Paris (he will take later the French nationality), and it is in the advertising that he began his career in France, working for the most important agencies of the time. 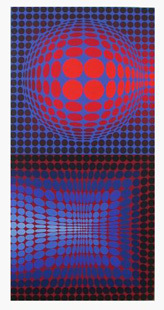 During the next 10 years, Vasarely is continuing his research on the graphic arts while doing his job in advertising, having finally established his own agency. 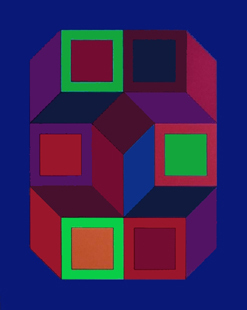 Vasarely exhibited for the first time at the Galerie Denise Rene in 1944, from that time, the artist gradually abandons its advertising business to devote more fully to painting, looking at works by Malevich, Delaunay, or Mondrian Arp. The painting of Vasarely is still at this time figurative, it was only a decade later that the artist moves to geometrical works, associations of images, optical illusions that we know today. During the 60's, Vasarely received several important awards as the Guggenheim prize, the first prize of the engraving of Ljubljana, as well as the grand prize of the Sao Paulo Biennial. 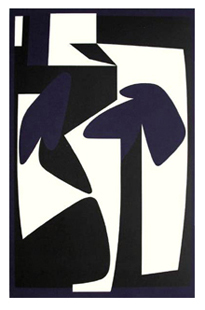 His work (especially his graphic works, the artist making a lot of prints, lithographs, etchings and serigraphs) are widely disseminated and Vasarely made the decoration of many buildings around the world (University of Caracas, Museum Jerusalem Hall, Montparnasse station in Paris, Faculty of Letters of Montpellier.). Vasarely created even in 1970 the foundation Vasarely in the Vaucluse, originally designed to preserve, protect and promote his work. We know that this foundation had big problems recently as a result of mismanagement. There are two other foundations Vasarely in the birthplace of the artist in Hungary. 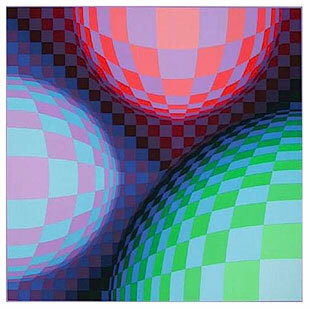 Vasarely died in 1997 in Paris. The artist has exhibited in galleries and museums worldwide. Vasarely is the undisputed master of kinetic art and the Op Art (art optical).